Data is a thing of power and beauty, Intel announced in a video introducing its session on the Internet of Things and Big Data Insights, stating that data is an abundant resource that is underutilized. Data that can be securely shared can even lead to the cure for diseases like cancer and more personalized medical treatments. In its session on big data analytics, Intel demonstrated how industrial IoT devices can be connected and given RealSense cameras to sense, see and understand the world around them as they collect data. Scientist must process and analyze that data, and Intel announced a few new tools to help data scientists make sense of the data. Bryant called data "the next big tech disrupter," and data, combined with the sensing IoT tech that collects data, can transform even the world's oldest industry: agriculture. Big data can be used to help solve real-world problems, like cancer research in healthcare. Intel's goal is to be able to map the human genome in one day to deliver precision healthcare that's personalized towards the patient by 2020. Why is precision healthcare important? The primary reason is that treatment can be performed outside of the hospital. Intel says that the US spends $10 billion a year to fight infections contracted while patients are in the hospital. With IoT devices and remote medicine, patients can seek in-home care and therapy, rather than risk infection in hospitals, in many instances. In an Oregon trial, Intel provided 450 people with a connected blood pressure cuff and the Basis Peak smartwatch. These devices provided 300 million data points per night, which is more data than what can be collected in a doctor's office visit. 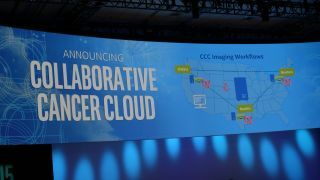 In helping to analyze and share this data in a safe and secure way, Intel announced its new Collaborative Cancer Cloud. Intel says that even when we have abundant collected data, the information is trapped because researchers are worried about the security implications of sharing. The benefit of sharing is that it can help speed up research, provide more rapid diagnosis and treatment and help researchers develop cures at a faster rate. To help researchers, the Collaborative Cancer Cloud will create a secure virtual machine for data to be shared. Once the information is shared, data is then wiped, said Diane Bryant, Intel Vice President and General Manager of Intel Data Center Group. Data can be used to help farmers understand more about their crops and fields, and this leads to the elimination of waste and an increase in production, Intel partner Farm Logs told the audience at IDF 2015. Farm Logs demonstrated a new sensor hub called Flow, which can connect to farming machines and harvest data from sensor networks. Once the data is collected, processed and analyzed, farmers can make better decisions about fertilizing, pest control, crop disease and more, said Doug Davis, Intel Senior Vice President and General Manager of Intel Internet of Things Group. Can you add senses to industrial equipment? Personalization is a big theme that was introduced by Intel CEO Brian Krzanich during his IDF keynote on Tuesday morning, and personalization results in being able to understand the world around you through seeing, hearing and touching. Can these inputs help create personalized farming equipment? Davis tasked a group of Intel interns with the challenge of bringing the company's RealSense 3D cameras to off-the-shelf robotics. Similar to Krzanich's control of robotic spiders during his keynote, interns used a computer with a RealSense camera on stage to control manufacturing robot arms during the demo. Set to the tunes of Beyonce's "Single Ladies" and Mark Ronson's "Uptown Funk" interns used arm gestures to control the robot arms to dance. While the demonstration may not necessarily apply to agriculture, I can see the potential use of Intel's RealSense technology for remote robotic surgeries in the future. Commercial IoT requires a platform that helps users make sense of the collected data with a scalable and flexible platform with tools, resources and technical support. Bryant claims that data is "the currency of the digital world," but that it takes more than just data. Once data is collected, how do you make sense of the data? Understanding the data is changing the conversation from data to algorithms, and this shift resulted in Harvard Business Review naming data scientist the top job of the 21st century. Intel made two announcements to help scientists understand the data. The first is Streaming SQL to enable real-time intelligence, and the second is Discovery Peak, an open-source, standards-based platform that Bryant claims will be easy to use, highly customizable to support your applications and innovative. Combined with fast memory from Intel's 3D XPoint-based Optane SSDs, data scientists will be able to store more data and have quicker access to data. Optane claims to be the first non-volatile memory that can be used as main system memory.